Clearly the image has untranslated Japanese it in, even though the rest of the card has been translated. I’m willing to bet it probably says something like “Mega Blastoise”, but just in case it’s more interesting than that, I figured I’d send this in! Anyway, the Japanese text in the center says ハイドロボンバード, which means “Hydro Bombard”. Which seems to make perfect sense, as that’s the text in English on the bottom half of the card. Hopefully that clears up that little mystery! If you liked this write-up and know any other fans of Pokemon, let them know about it. It'd be a great help! That is the actual final image! The english card has the attack name in Japanese on the art, while the Japanese version has the attack name in english on the art! Haha, that’s awesome! I’m sure that’s worth an article of its own, although I’d have to sit down and do some research and pondering. 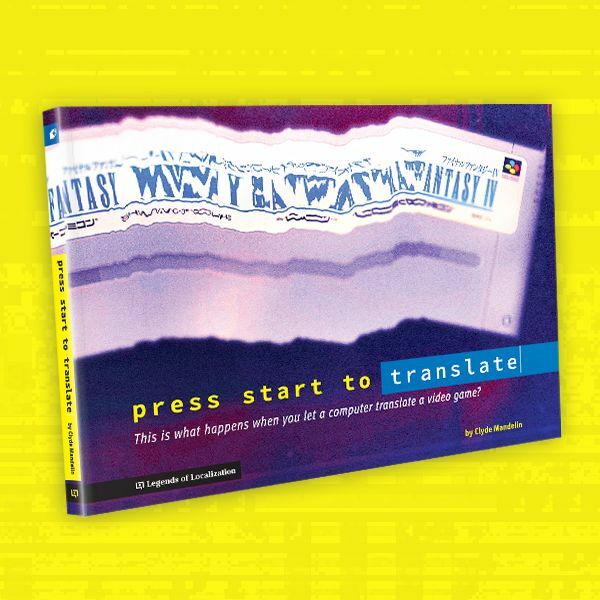 Pretty neat stuff, localization! Whoa, that’s crazy! Never would’ve guessed that! Makes no sense at all! xD Still, I guess it’s kinda cool! Obviously I find this interesting, lol. That actually is the final version of the card. I don’t keep up with the TCG side of Pokemon, but what I have picked up is that Mega Evolution cards all have their attack in the opposite language of the card. That is to say, if you looked up the Japanese version of this card, the “Hydro Bombard” part of the artwork would be in English while everything else is in Japanese. 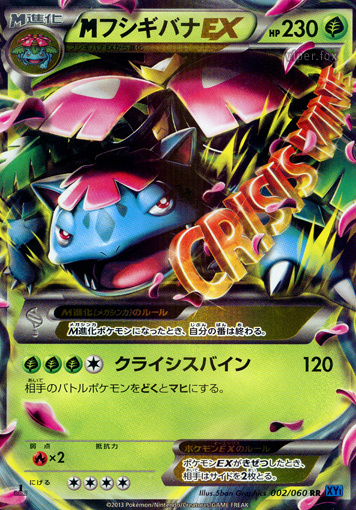 Or at least, that was the case with the Mega Venusaur card, whose Japanese version has “Crisis Vine” written in English, and English version has it written in Japanese. Very unique, it’s not often they ADD Japanese for the localization. Which is because Nintendo is crazy. I remember also the second Professor Layton had the explorer in the sewers talk in Japanese (in romaji though, since the game no longer has a Japanese font). Hey, did you know that the Japanese version of this card has the attack text in — oh, you’ve heard? My bad. In that case, I’ll just point out that this artwork is xtr33m. It’s like the official 1992 release of the Pokémon X/Y set. I’m kinda getting used to figuring out Katakana of english words (kinda fun, actually). Looking at this card, i was able to figure out the first part said “Hydro”. As i was trying to figure out the second half (i did recognize the final character as “do”), my eyes glanced down and saw the attack name and instantly realized that’s what the remaining katakana said. It’s been a long time since my last Japanese course, but I still find myself trying to decipher English words written in katakana all the time. It’s good practice, but not always easy. look almost exactly the same.. I can barely understand Japanese by the way outside of the general anime/RPG terminology stuff, but I can’t wait for byuu’s fan-translation. Wasn’t there some pun or something using those two in Mother 2? I thought i remembered seeing it somewhere in Mato’s comparisons. You sure get to my Pokemon questions quickly, Mato. 🙂 Interesting to see in the comments that the original Japanese version has English text instead! O_o I was just looking through the images on Serebii.net when I found this, didn’t think to look at the other Mega Evolutions to see if they had it, too. A very strange choice IMO, but I guess it sorta ties in to how X and Y got the worldwide release and all that? I may never understand. That’s really strange but also really neat – I wonder why it’s like that. I guess maybe the “foreign-ness” of another language makes it more stylish or something. NEAT, I’m a card colleter & were did you find IT! Can anyone explain b to me what the numbers on the bottom right hand of the card mean? 30/146 just means that it’s Card No. 30 out of the 146-card set. Having the katakana (it is katakana, right?) makes the card have a JoJo feel to it, almost. Or maybe I’m just so obsessed that’s what my first thought is. The art style on this card is very reminiscent of the anime opening theme sequences we’ve been seeing in the modern adaptation. 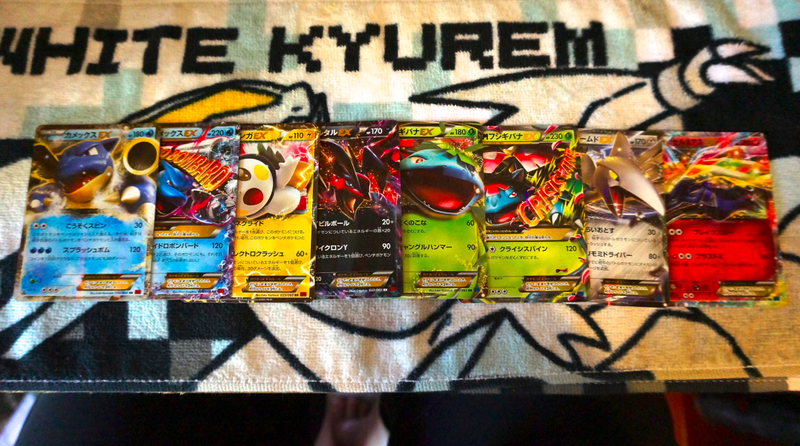 I have the Mega EX Ampharos card and I was trying to decode it for a long time. I gave up and finally did a search online. It finally makes sense! 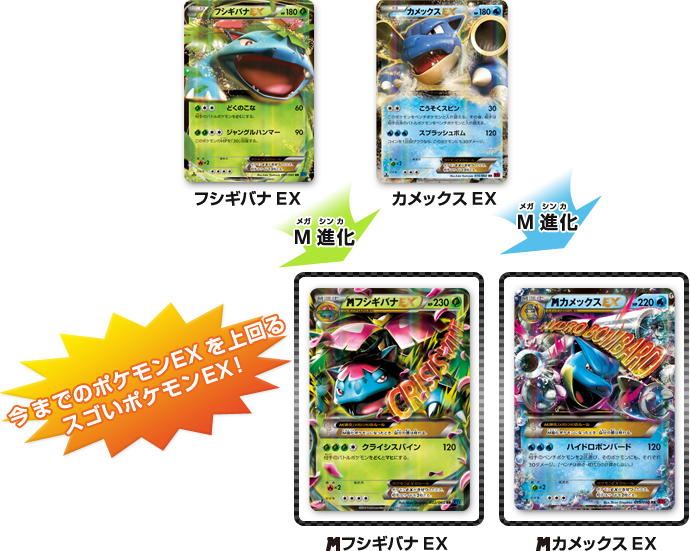 It seens most Mega Evolution cards have the name of their attacks written in Japanese in their image.